There has been a heightened awareness of the threat of a terror attack on the UK - and London in particular - since the assault on the US on 11 September 2001. In March 2004, then Metropolitan Police commissioner Sir John Stevens described an attack as "inevitable", and said police had intercepted several attempted plots. Before Thursday's blasts, officials had stressed the public should be alert, not alarmed, and insisted the capital had been well-drilled to face security incidents. They said the aim must be to manage risk, saying it is impossible to eliminate risk altogether. Spending on security rose from an annual £950m ($1.7bn) before 2001, according to Chancellor Gordon Brown, to £1.5bn in 2004-05 to reach £2.1bn by 2007-08. There have been some highly visible examples of increasing readiness. A report on the drill said improvements had been made but that more work was needed, particularly in preparing specific alternative plans for rescuing people underground. It also found problems in communications, including masks which interfered with radios. Ministers said the exercise had been very valuable. 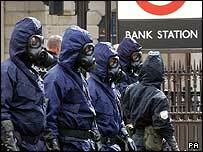 In February 2003, tanks and hundreds of police and troops were deployed to Heathrow airport after intelligence reports suggested militants might be plotting a missile attack on a passenger plane. An inter-agency team, London Resilience, was set up following 9/11 to review preparedness for an attack and co-ordinate sectors including the emergency services, utilities, health, transport, and business. It found London's emergency response arrangements were "well prepared for the types of major incident that had been considered previously. However work was needed to address the scale and nature of new threats." Following Thursday's apparently co-ordinated explosions across the capital, the Metropolitan police commissioner Sir Ian Blair said it was a situation "for which we have planned and prepared". "A very significant and sophisticated emergency operation is now swinging into effect," he told the BBC. Three decades of attacks by the IRA in England - there have never been attacks in Wales or Scotland - mean authorities and civilians are well-versed in maintaining a certain level of vigilance and preparedness against attack. But Islamic extremists, considered by many to pose the greatest threat today, may strike different targets and use different techniques. A two-year study by eight leading academics in February found that there were holes in security in the UK's transport sector, emergency services were underfunded, the private sector was largely underprepared and that regions outside London were falling behind in preparing for an attack. The authors - led by Paul Wilkinson, of the Centre for the Study of Terrorism and Political Violence at St Andrew's University - withheld sensitive findings on weaknesses in the "national critical infrastructure". This term is used to cover strategic energy supplies, the financial sector, and government administration. 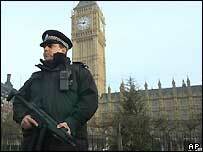 A series of stunts on parliament has prompted questions about the security arrangements there. In May 2004, campaigners from the Fathers 4 Justice group invaded the House of Commons to pelt Tony Blair with flour bombs, and fox hunt supporters stormed the building in September. Similarly, some critics accuse the government of using the threat to push through unpopular measures such as control orders and ID cards. The study by the eight academics warned against allowing counter-terrorist policies to become a "party political football". But the report confirmed the threat from al-Qaeda is "genuine and serious", and notes that some plots have been foiled. The official terrorism threat level was lowered slightly from "severe general" to "substantial" at the end of May but at the time security sources stressed there was still a real and serious threat to UK interests. It is understood the threat level has now been raised again.